Mallet Finger (or Baseball Finger) is an injury to the thin extensor tendon that straightens the tip of the finger. The extensor tendon runs along the top of your finger to the tip, where it attaches to a small bone. With an injury, the tendon itself may tear or the force of a blow causes the tendon to pull a piece of the bone off, causing a fracture. 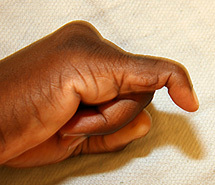 Either way, the injury leaves the extensor tendon unable to straighten the tip of the finger. The hallmark of the injury is sagging or drooping of the tip of the finger in a bent position and an inability to straighten it on your own. Pain and swelling are also common. In chronic cases that did not receive treatment soon after injury the finger deformity may be greater, with the tip of the finger bent down and the middle knuckle angled upwards in a hyperextended position. This results from an imbalance in the pull of the remaining extensor and flexor tendons that travel on the back and front of the finger. This injury is common in sports like Baseball, Softball, and Basketball, where the ball hits the tip of the finger and jams it down. Alternatively, a seemingly minor sprain of the finger tip can tear the tendon. Deep lacerations on top of the finger can cut the tendon, resulting in the same problem. Speaking with you and a careful physical examination are central to making the diagnosis. An x-ray will help determine if the injury includes a fracture or not. When the injury is diagnosed early the tip of the injured finger is normally splinted fully straight. The splint only needs to immobilize the tip of the finger in a straight position, while the rest of the finger can be free to bend and straighten. For a purely tendon injury the splint is worn full-time for a period of 8 weeks. If a fracture is present then the splint is worn full-time for 4-6 weeks, because the bone heals faster than the tendon. Surgery is usually unnecessary, unless there is a large fracture with dislocation of the joint, an open wound, or chronic cases with more complex deformity. If your job prevents you from wearing a splint on the finger, a small procedure to insert a metal pin across the joint to keep it straight can be performed. The pin is left in for the same period of time as a splint would be worn. Mallet Finger injuries are common and prompt diagnosis will typically allow for straight forward splint treatment and return to use of your hand. Call Dr. Pruzansky at 212-249-8700 to schedule an appointment.